When my son was a younger preschooler, "No David" by David Shannon was one of his favorite books. He loved to watch David do bad things and he loved to "read along" as he chimed in with mom's familiar refrain, "NO David!" Since Logan is now a big stuff preschooler headed off to PreK, I thought it would be fun to introduce David goes to School. 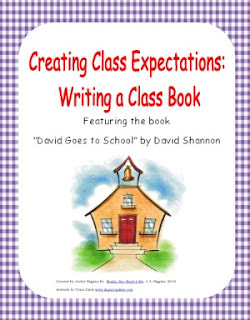 In David Goes to School by David Shannon, the mischevious character all kids love is all grown up and headed to school. Of course, even as a school-aged child he has not grown out of his trouble making ways. This time, he's causing trouble in all the traditional ways. He's goofing around at the blackboard, chewing gum in class, drawing on his desk, and starting food fights. This book was a fun way to talk about what NOT to do at school. For our book activity, we took a postivite twist. We created a "Yes, Logan!" book. We also read the book, "No David" and looked at how the author used a repetitive phrase on each page. We practiced finding the words "no" and "David". On each page, he wrote his name and drew a picture of something positive he could do at school. Logan can hold mom's hand in the parking lot at school. Logan can wait his turn in line. Logan was able to write the text in the book himself just by writing his name on the lines. He also drew some of the pictures. We did some interactive drawing and we shared the pen. It was a great opportunity to show him how to draw some of the things he will want to include in future stories that he writes (draws). Older students will probably be able to create the book independently. 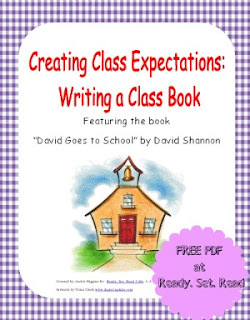 This book activity could be used at home to prepare a child for going back to school. It could also be used in the classroom during the first weeks of school. Each student could add a page or a few pages to a class book or they could make individual books. I have a free printable with teachers guide for this writing activity. Just click the picture below to get this as a free google doc. We are celebrating this week with a Back to School Bash. I have several free back to school printables and a book giveaway. Come back on Friday to see our final BIG giveaway from Samson's Classroom. Make sure you check these out. Free Printable Name Activity and Teacher's Guide for the book Chrysanthemum. Win a free copy of the book Chrysanthemum by Kevin Henkes. (One winner will be selected, contest ends August 28th). So glad I found your blog. My Preschoolers love making books. I am a new follower. Hope to see you at True Aim! Love this. Thank you for creating an awesome activity for kiddo's. I am using it today with my Kindergarten students...it is the end of their first week of school and what a great way to end it...with a book! Thank you for sharing this at TBA and linking up! I am your newest follower, I would love for you to follow me too! Making a book looks like such fun! This book looks great for Back to School.